I love the Summer Silhouettes stamp set, and use it a lot for cards. It seemed like the perfect set to dig out to decorate the hand-bag shaped gift bag. This bag is perfect for little (and not so little) girls. Can you think of any who would not like to receive a gift in a lovely little bag like this? I kept the colours simple – just one. The bag fastens using a brad with a candy dot, and the fastening “device” is made using the lovely Scalloped Tag Topper punch which leaves an aperture just the right size. Anyone would think I had planned it! A little bit of punching and inking and that is that. When I was prepping for the video, I had just received my new Stampin’ Up! order which included some Basic Black cardstock. Basic Black card is one of those things I kept meaning to add to the order, and then kept forgetting (a bit like the paper piercer which I still don’t have), and this seemed like the perfect time to have a play with it. 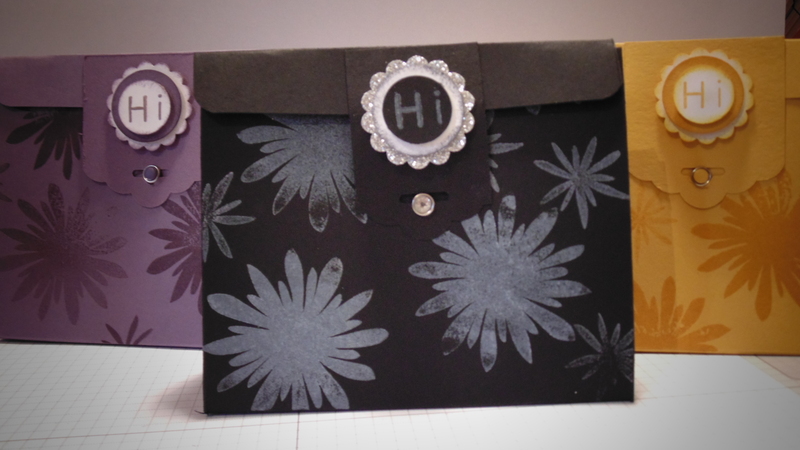 Then I decided to change the stamp set I used from Summer Silhouettes to Flower Patch, and added some glimmer paper. If you want to watch the video, click HERE, but be warned I changed the project (again) slightly part way through which is never a good idea! (Oh, and the camera kept going in and out of focus).